so ive been cutting and spraying all day and this is what ive come up with. im thinking about making prints or tshirts with some of these ideas. now, part of me wants to screen print onto shirts to make it look legit, but the other part of me doesnt want to spend that much money on the chemicals i need (i have screens and a squeegee, so i dont have to buy that stuff). ive only posted 2 of these in the doodle thread but now that ive got 5 cut out i decided to make my own thread, and because i have more ideas that im planning on cutting out. ive talked to a couple of friends about it but i wanted that special internet opinion, so what i want to know from you guys is if these designs are legit. i really could use some feedback from strangers instead of the parental "awwww thats super." i know we have some art stars on this site so im really banking on some critiques here. I really like the first one, and beard one is strangely appealing to me as well. The others I'm not so crazy about. I'm not sure I get the joke with the "Money Lisa" one (I'm assuming there's supposed to be some sort of joke there). The monkey one is a little too small and blurry, so I'm not too sure about that. 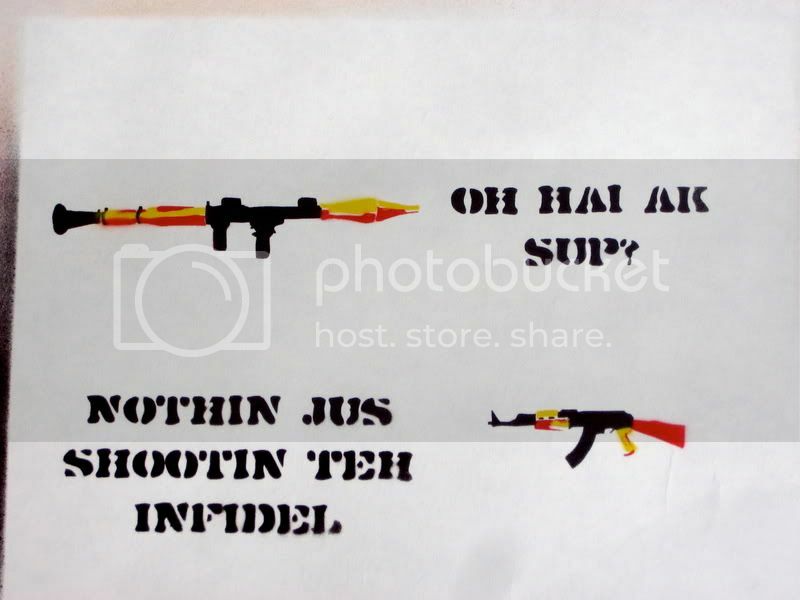 The one with the rocket launcher and machine gun...I don't know, it doesn't do anything for me. Maybe others will feel differently. These definitely have some potential...I wouldn't mind seeing some more along the lines of the first one. Did you make these by taking the base image, say of the mona lisa, then drawing the outlines of the regions to be cut out, and then cutting out a stencil for each color? I'm not sure that stencil is the right term for that, but that's what I'll call them. I find the first one to be pretty interesting compositionally, thanks to 4 colors and very interesting shapes, but the others are not so great. The beard one is boring, one color, one stencil, small images and big text, yawn. The AK one is also boring, too much text, not enough color, not enough focus on the small images. I'd want the image to be big and dominant and central, to grab the viewer's eye. The first one accomplishes this. 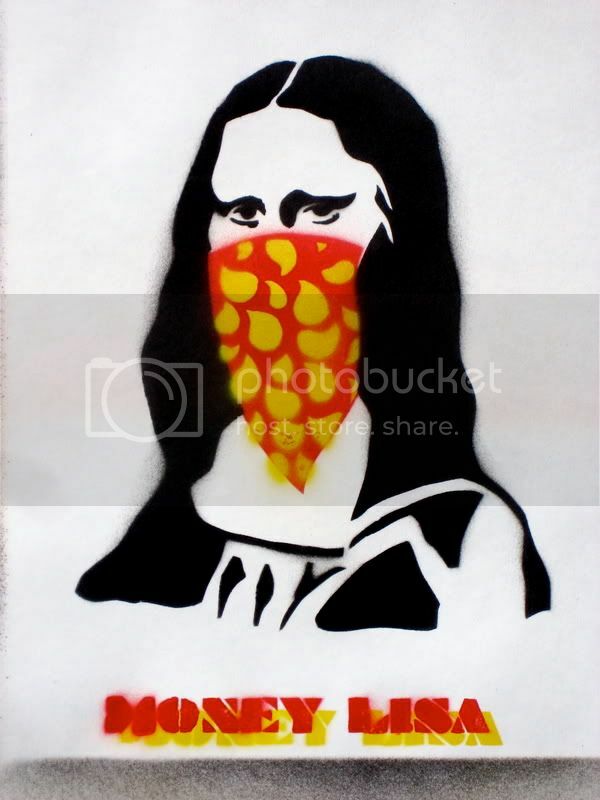 The mona lisa one has the right idea but it could use more variation, the single big block of color of the bandana superimposed on the black mona lisa is kind of grating, and it doesn't have much in the way of interesting shapes. What exactly do you mean by a design being "legit?" 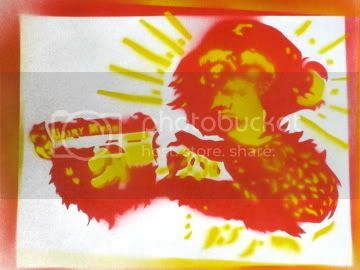 Oh yeah, the monkey one has interesting shapes, but only 2 colors, and it's kind of blurry and small. Oh man, that was a mistake. I really didn't mean to do that. Life is a ____, depending on how you dress her. I dig the design of the first and the last is strangely appealing to me. The rest seem cliche in terms of what's been done in the past. I like the first one the most. Eyes are too far apart, but its solid otherwise. The rest, eh. I was never a big Banksy fan. ok, cool guys. im glad to get some input. im happy that everyone seems to like the first one, we're in agreement that thats my strongest piece right now. im also amused that some of you find other designs "strangely appealing". @bahamutZERO: yes, i call these stencils. that's the commonly accepted name for them. @Bongo: mona lisa, sure, ak's and rocket lauchers i can understand, monkeys with guns... maybe these have all been done before, but come on man, even the beard hall of fame? so im definitely going to revisit the monkey drawing, maybe rework a few others. but yeah i like the feedback. here are two more designs... the first one i did a mock up on my computer that looks a bit crappy because i was using the pen tool with my laptop so i dont have very good lines on it, but i had something like this sitting in my sketchbook and i feel like its more along the lines of the first ones... maybe even a little too similar to it. i also was completely indecisive about whether it should have text and how much. 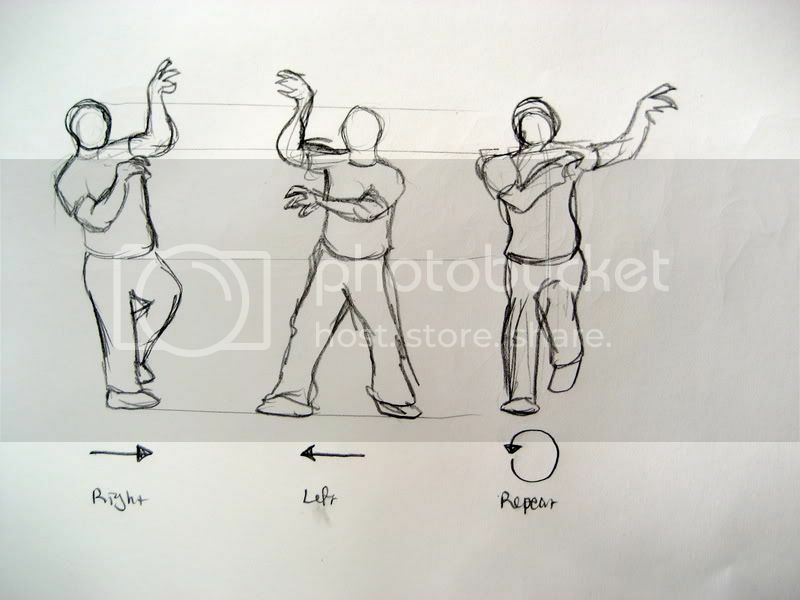 the second one is a rough sketch for my instructional guide to dancing the thriller. i dont know about you guys, but it makes me laugh when i see it. i just need to draw more michael jackson-esque clothing. 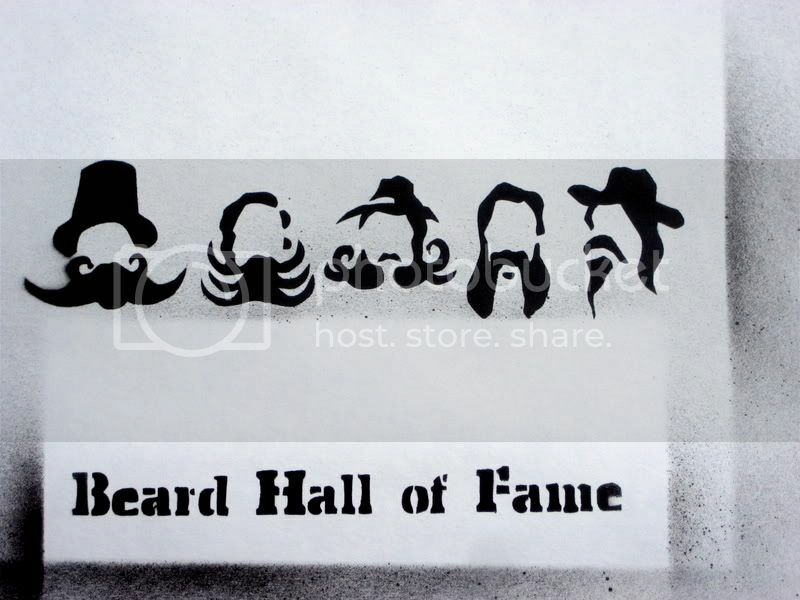 I could swear I've seen someone wearing a "beard hall of fame" t-shirt before. And I know I've definetly seen it sprayed up too (along with everything else to ever go up on one of those threadless style sites). The first piece literally made me exclaim "Woah!" "We are just an advanced breed of monkeys on a minor planet of a very average star. But we can understand the Universe. That makes us something very special. " Maybe this is pure coincidence, but that was a rip off from some other urban graffiti artist in London. If only I could remember his name. The only other thing I remember was that he never liked to have his photo taken, always dressing up in disguises each time he went to paint in public. Anyways, he later redid that piece on the same billboard with both of them in banana suits. The first one is way better than the other ones, none of the other ones really look that great but the first one really works as a stencil. All this underspray and overspray though is making your stuff look really amateur. For the underspray, you can just use some spray adhesive or just be more careful. What are you cutting these out of? I always used those manilla office folders and those usually worked fine. Also, for the overspray, since these are all on canvas you can just put extra paper or something on the outside of the stencil. In case it was intentional, don't do that. I've only seen one or two artists that can even try and pull that off, when everyone else does it it just looks accidental. Also, spray down a backround color or just some kind of backround first when you're doing stuff like the first one, it'll make it look more finished. 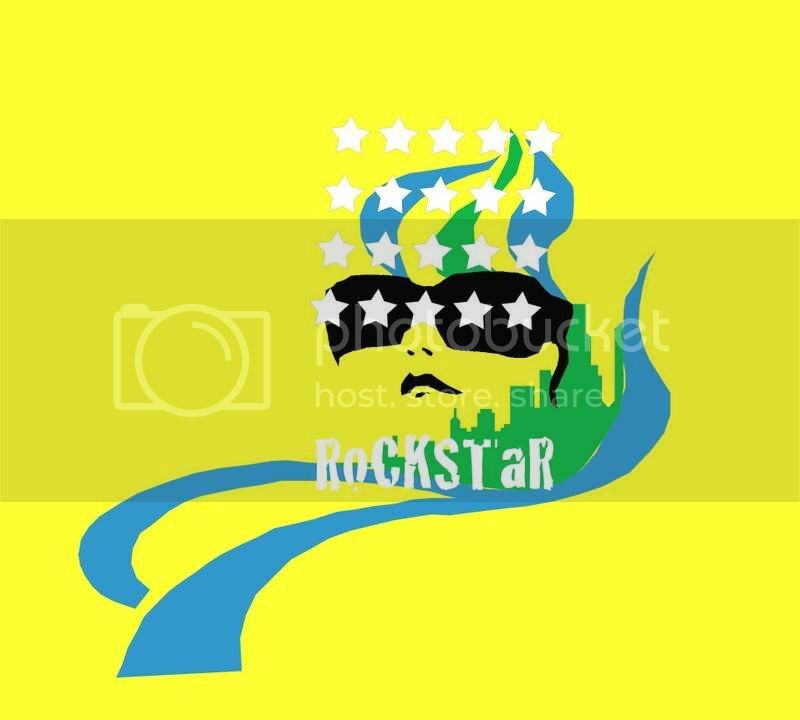 Theres lots of info on www.stencilrevolution.com, and on the forums there. 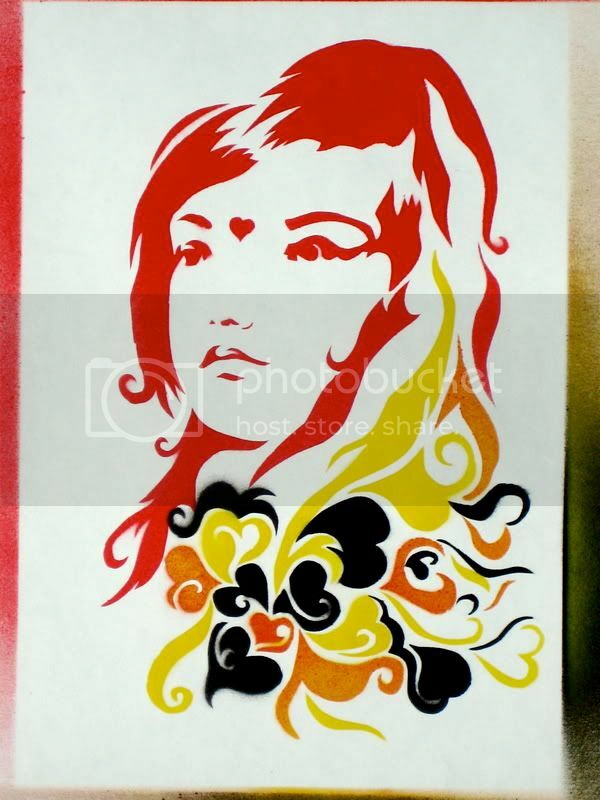 I also used to stencil a lot.